The discovery was unique, yet I only understood just how important it really was a few hours later, when we got back to the safe house in Kobane’s western parts. 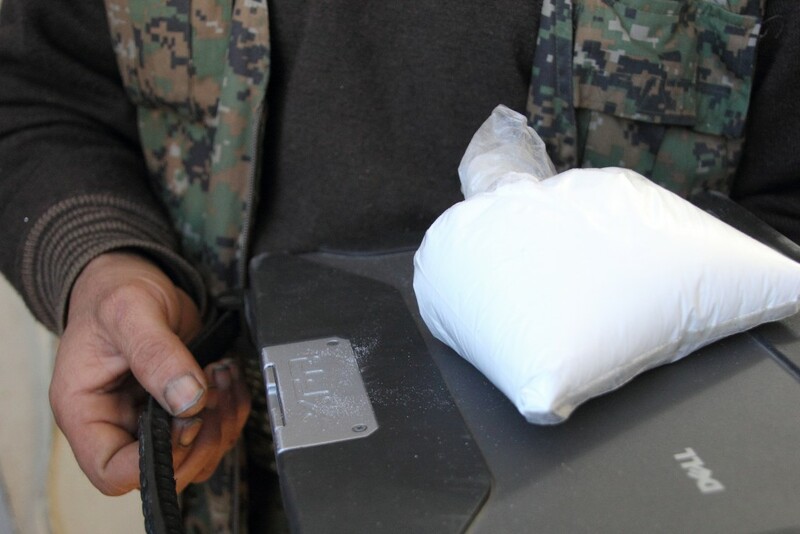 We had found a huge bag of crystal white powder – yes, cocaine – among the possessions of a recently killed leader of Daesh/IS. The gang of fundamentalist fighters, who claim to be the best of religious people and the defenders of the new and ambitious ”Caliphate”. Who claim to be the Avantgarde of the new ”Islamic State”, of it’s correct way of living, and have been wanting to demonstrate their purity and abstention from all hellish drugs by burning both alleged cannabis, pharmaceutical pills and even ordinary tobacco in propaganda videos. It is all just a big lie. And I documented the big bag of cocaine to prove it. All of this has become widespread international news. One American, far-right online magazine did some own research and estimate the content to be worth 500 000 dollars on the streets. Another writer described my reporting as with ”candor you’re unlikely to find from a traditional news outlet”. What can I say, extreme places can call for extreme measures. A few days ago some alleged militant sympathizers of Daesh/IS killed 17 innocent people in Paris during the course of three days. Among them several fellow Journalists. A picture from a video recorded by one of the militants has been circulating, showing him in front of the notorious black flag of the ”Caliphate”. Personally I have been feeling how all of this is both for real, but still not. Daesh/IS are attacking, enslaving and killing all people of colour and faith they imagine as enemies – true. But they also try to present themselves as something new, as something very different, much superior, purer, and far more moral than the rest of the decadent world. This is completely false, and the hypocracy is once again proven by the bag of cocaine. That not even Kobane’s Kurds – hated by Daesh for being seen as too modern, secular, and West-aligned – knew what it was. This has also proven to be my third big scoop from Syria in 2014. The first two occured when I was both present at the Syrian-Iraqi border in Rojava and could document when the Yezidi Kurds arrived directly from Mount Sengal after being rescued by YPG/YPJ/PKK forces in early August, and when I ended up being the last Western Journalist still in Kobane before the arrival of Daesh/IS in early October, and could document the atmosphere. The first two gave me no pleasure, as I among much bravery also had to witness a lot of fear, trauma, tears and death. This third one I fully enjoy. Read the whole story thas was published by VICE some days ago, where there are also a few still shots, and the video below of the finding. Spread the word.